1/3 cup mixed shredded Italian cheese (I used asagio, Parmesan, Romano) PLUS some for topping if desired. Throughly drain the spinach and artichoke by pressing it with paper towels to remove all moisture. Place in a large bowl. Add remaining ingredients and stir until well combined. Refrigerate until ready to eat. Scrape into a 8x8 inch baking dish. Preheat oven to 350. Sprinkle with additional cheese, if desired. Bake, uncovered, for 10-15 minutes or until warmed through. Refrigerate leftovers. Serve with bread or sturdy chips. For the past few New Year's Eves we've been having themed nights with food, drinks, candy, movies and games from different decades. We started in the '80s and worked our way back to the '20s last year. This year we decided to finally tackle the '90s which was way harder than one might think. Diet food (Snackwells, anyone?) was hugely popular and nearly every candy or drink that was invented then has since been discontinued. No notable games debuted then either. I also had a difficult time coming up with a menu. I always like to serve something snacking and from reading magazine and newspaper archives from the '90s, I noticed that nearly every publication of the early 1990s featured some version of spinach-artichoke dip, often served in hollowed out bread. So I made my own version which I think tastes fresher than the ones I found. The trick is not cooking the spinach or artichokes prior to mixing the dip. If they are throughly defrosted (I just put my mine in the fridge overnight) there is no reason to cook them, they are perfectly soft and will be warmed through during the baking step. 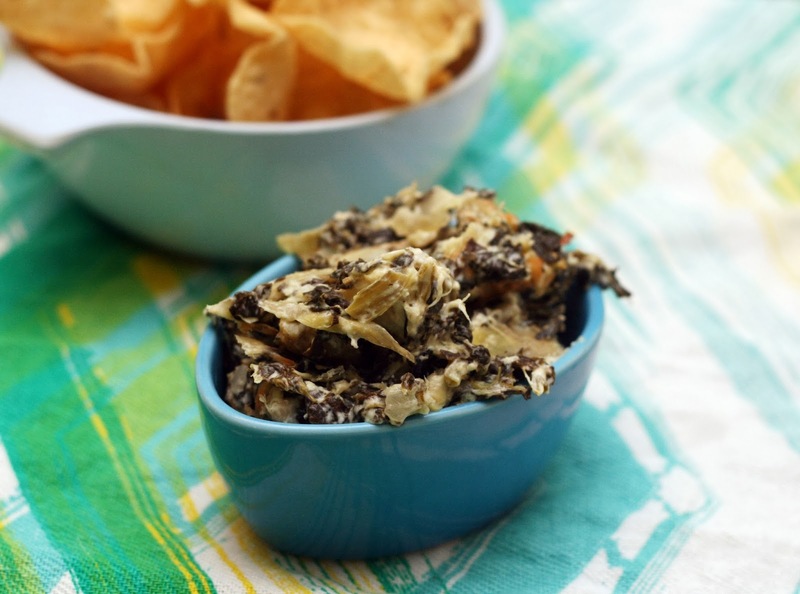 The uncooked spinach and artichoke give the dip a much fresher taste than cooked. I did use granulated garlic (I love Costco's) and dehydrated onions because I think they add more flavor and get more evenly distributed in the dip then fresh. Plus they do not add extra moisture which is the sworn enemy of spinach-artichoke dip. My husband said that it is his favorite out of all the dips I've ever made!